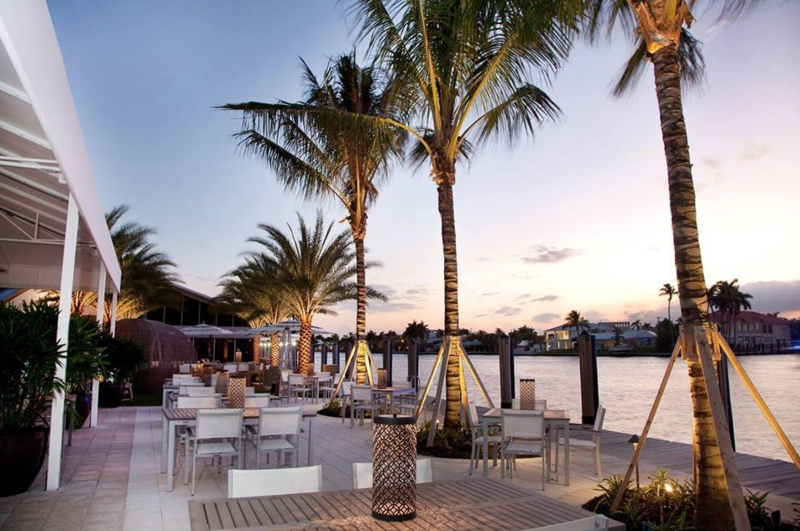 Looking for the best happy hours in Fort Lauderdale with killer water views? Here are a few of the best restaurants and bars in the area. Located inside the Fort Lauderdale Marina, 15th Street Fisheries has been serving fresh Florida seafood on the Intracoastal Waterway to hungry boaters for years. Dine dockside for a more laid back experience and live music on Friday, Saturday and Sunday. Or make reservations upstairs for an upscale romantic dinner. You can also feed the tarpon from the dock! Happy Hour: 4 to 7 p.m. AND 10 p.m. to close, Monday – Friday. $5 house wine and craft beer flights, $6 single call drinks, $7 Belevedere and Kettle one singles, $1 off all beer (bottles and draft). Sunday Brunch: 11:30 a.m. – 3:00 p.m. featuring $3 Bahama Mamas, $7 Chandon Delice Bellinis & Mimosas, $7 Mionetto Prosecco Splits, $10 Fisheries Old Floridians, $60 Moët & Chandon Imperial bottles and live music. 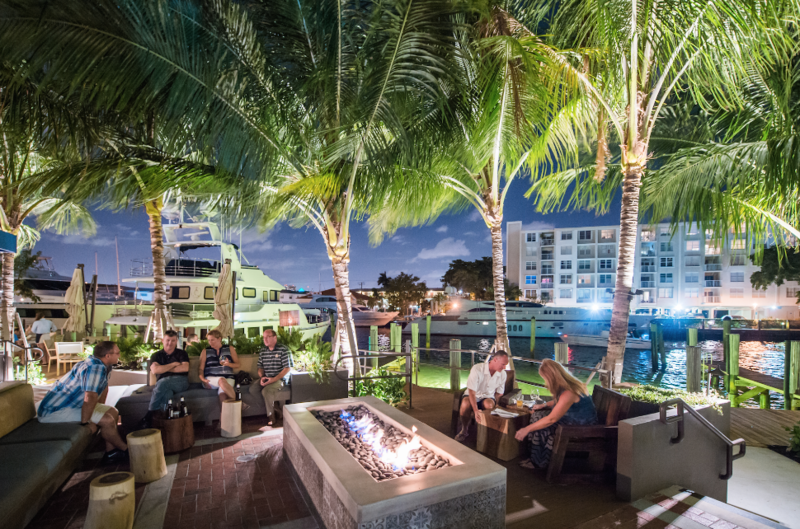 Boatyard, a reincarnated version of the former Bimini Boatyard, exudes Fort Lauderdale’s sophisticated yachting culture. Led by The Restaurant People, the same group behind local hotspots like YOLO, S3 and Fork & Balls, the waterfront restaurant features a seafood-centric menu with daily catch specials from local fisherman and a raw bar that will make your mouth water. Check out the live music on Friday, Saturday and Sunday. Happy Hour: 4 to 7 p.m. Monday – Friday. Half priced wine, beer and cocktails. Boats & Bubbles: On select Thursday nights, ladies drink free from 7 to 10 p.m. and boat rides are available on a Van Dutch yacht for a $10 charity donation. More than just a speakeasy-style watering hole, Burlock Coast Seafare & Spirits is an oceanfront restaurant, bar and market all rolled into one. 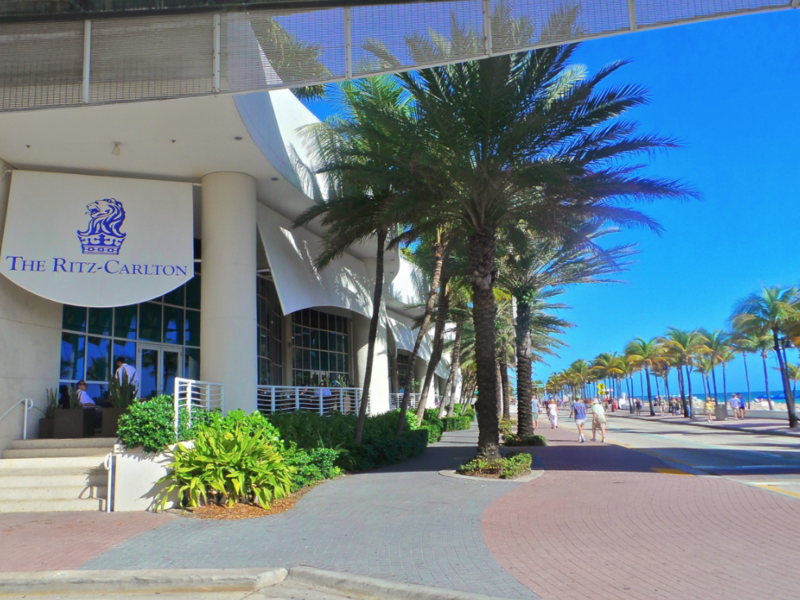 Located at The Ritz Carlton, Fort Lauderdale, the restaurant is named after the burlock bag that sea captain and smuggler Bill McCoy invented to transport his rum safely overseas during Prohibition. Try Chef Gavin Pera’s fish n’ chips lightly misted with house-made vinegar and sip on handcrafted cocktail like The Moonshine State or Bill’s Spirit. Happy Hour: 4 to 6 p.m. Monday – Friday. $6 beers, wine and cocktails and $6 bar bites. Sunday Brunch: $20 bottomless mimosas, Bloody Marys, rum punch and house brew. Plus $1 oysters! An oldie but a goodie! 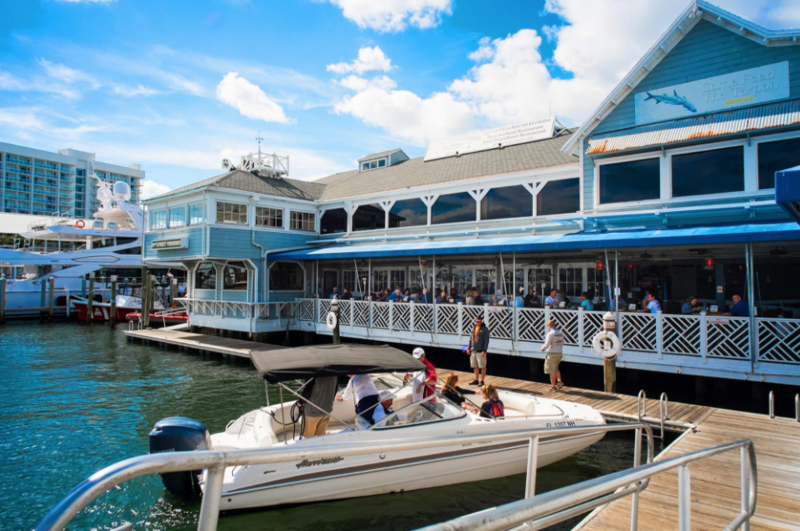 For a laid-back bar scene offering great food and killer views, check out the newly renovated Shooters Waterfront. Enjoy the serene water views and live music on Friday, Saturday and Sunday. Happy Hour: 4 to 7 p.m. Monday – Friday. Half off of all drinks at the bar. 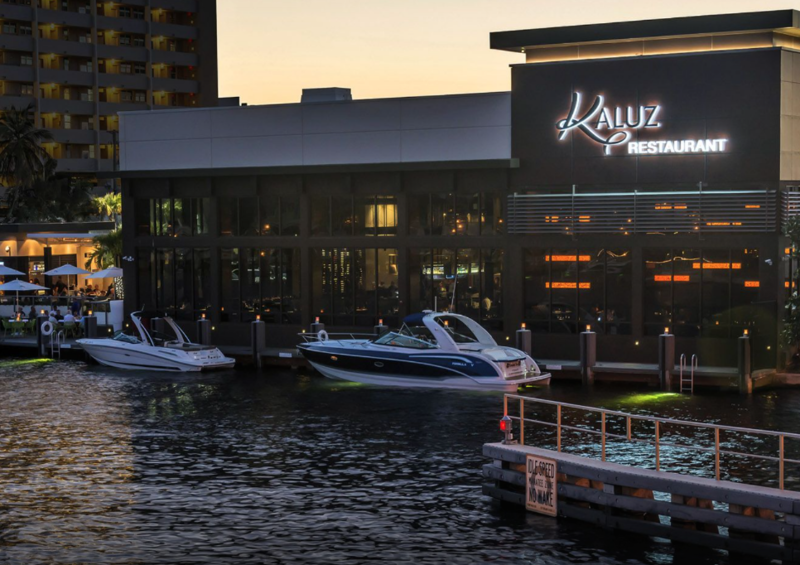 Situated directly on the waterfront and located a little farther north than the previous restaurants (that’s why it isn’t on the water taxi route), Kaluz Restaurant is a chic New American style restaurant featuring appetizers like tuna tartar and steamed mussels, as well as flatbreads, salads, sandwiches and entrees that run the gamut. Happy Hour: 3 to 6 p.m. Monday – Friday. Includes deals on small plates, $4.50 draft beers, $7 wines by the glass and $7 well cocktails. Must-visit mainstay, Casa D’Angelo offers expertly constructed Italian dishes prepared with the freshest ingredients. If a taste of Italy is what you’re craving, then you can’t go wrong here. Read more. Sip on a fine selection of craft beer and nosh on eclectic small plates at TAP 42, located south of downtown. Monday night is burger night! Also on the beach, Steak 954 at the W Fort Lauderdale offers a lip-smacking selection of perfectly aged steaks and fresh raw bar items. The restaurant’s glow-in-the-dark neon jellyfish tank is quite the showstopper. Start your evening with a bang at Whiskey Blue, also at The W. An exotic drink called the Spicy Paloma (El Jimador Tequila, lime juice, Sprite and Tabasco sauce) will surely give your tastebuds a kick. Featuring cuisine centered on Italy’s Naples and Salerno region, Cibo Wine Bar’s Fort Lauderdale outpost is already becoming as popular as the Miami locations. Watch while a “wine angel” soars above the bar and retrieves the perfect vintage from 2500 bottles to match your authentic Italian eats. Visit Apothecary 330 in downtown’s Himmarshee Village for an old-school 1920’s era speakeasy vibe. Being dubbed Broward County’s first cocktail club, the bar is the co-concept to the newly-opened Pizzacraft. Fox’s Hell’s Kitchen contender, Executive Chef Bret Hauser serves up wood-fired pizza and homemade pasta. Also by the same owners, Himmarshee Public House serves up old American comfort food such as slow-cooked meatballs with whipped ricotta and basil. Tempt the taste buds at Pelican Grand Beach Resort’s OCEAN2000 where Executive Chef Michael Bloise hosts a monthly full moon dining experience overlooking the Atlantic Ocean. Famous for her role on Food Network’s Chopped, Executive Chef Adrienne Grenier unveiled a brand new menu at 3030 Ocean following an extensive three-month renovation at the Fort Lauderdale Marriott Harbor Beach Resort & Spa. For an upscale gastropub experience located in the heart of the action on Las Olas Boulevard, check out American Social. Hospitality and entertainment impresario Sam Nazarian, famous for his sbe branded outposts in places like South Beach and Beverly Hills, recently opened Hyde Beach Kitchen + Cocktails in Hallandale Beach. Nosh on Executive Chef Danny Elmaleh’s cross-cultural cuisine like wasabi tuna tartar and drink in the panoramic ocean views as you sip on fancy libations.